Netanyahu, Japanese PM Shinzo Abe commiserate on their shared nuclear threats: Iran and North Korea. The prime ministers of Japan and Israel compared notes Monday about living near countries with suspected illicit nuclear weapons programs, according to AFP. Binyamin Netanyahu, on the second day of a five-day trip to Japan, said the international community should keep up pressure on Iran, which the West suspects of trying to develop atomic bombs. In a joint statement released with his Japanese counterpart Shinzo Abe, the two men also "expressed their strong hope for the early resolution of various issues of concerns regarding North Korea, including its nuclear development." Speaking at a joint news conference after their meeting, Netanyahu said Abe had told him in no uncertain terms that Japan was facing a very real threat from the North, which observers say is preparing for a fourth nuclear test. "The same words -- 'clear and present danger' -- certainly apply to the Iranian nuclear program as well," he said. "Like North Korea before it, Iran wants to keep its military capabilities, military nuclear capabilities while easing the sanctions that are applied to it." "We cannot let the ayatollahs win," Netanyahu added. 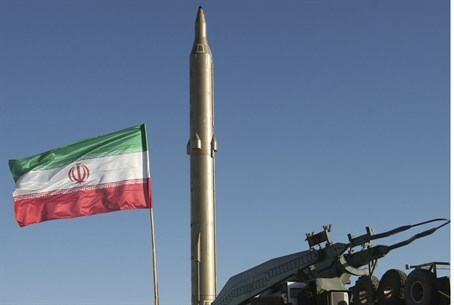 Tehran insists its nuclear program is intended only to generate power for civilian purposes. Iran and the five permanent members of the UN Security Council plus Germany will begin talks in Vienna on Tuesday when they start drafting the text of a comprehensive and potentially historic deal. An accord would de-fang Iran's atomic program with a drastic reduction in scale. In return, all UN Security Council sanctions and additional unilateral sanctions targeting Iran's lifeblood oil exports would be lifted. Japan, which depends heavily on Middle Eastern oil, has maintained friendly relations with Iran through its years of ostracism by the West. Netanyahu and Abe also "confirmed the necessity of cooperation in the field of cyber-security and... affirmed the importance of bilateral defense cooperation", according to the statement. 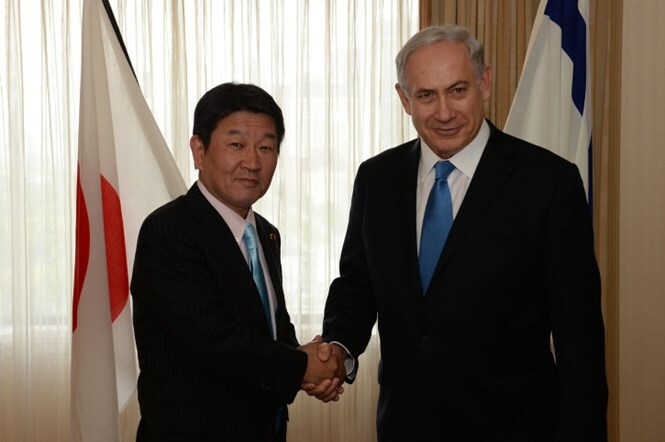 "They concurred with the visit of officers of the Japan Self-Defense Forces to Israel." Abe is pushing for Japan's well-equipped and well-trained military to take a more active role in world affairs, a strategy he has dubbed a "proactive contribution to peace". Under the current constitution the Japanese military can only fire if fired upon, but Abe would like to expand the scope of their activities to include so-called "collective self-defense". The issue is controversial in Japan, where the post-World War II commitment to pacifism runs deep. Agreements to carry out officer visits to friendly nations are the kind of baby-steps the Abe administration hopes will eventually lead to greater acceptance of the nation's military, nearly seven decades after its total defeat. In a brief reference to the moribund Middle East peace process, the joint statement said: "Both sides emphasized the necessity for achieving peace through a 'two-state solution' toward stability and prosperity of the Middle Eastern region." "Prime Minister Abe called upon all concerned parties to further endeavor to advance the direct negotiations and expressed his intention to make best efforts for achieving peace." Negotiations collapsed last month after Fatah and Hamas buried the hatchet, ending years of bitter rivalry - and torpedoing negotiations. Israel refuses to talk to Hamas, who is internationally recognized as a terror organization. Netanyahu, who is in Japan until Thursday, is expected to meet Japanese business leaders on Tuesday. His trip is expected to be heavily weighted towards hi-tech trade between the two countries. The Prime Minister has already met with executives from Panasonic Monday, where he discussed the importance of cyber-security in fighting nuclear threats. "There is one area that transcends everything and affects everything and this is the question of cyber security. All the systems that I saw here are computerized systems; they're all vulnerable," he said. "Cyber security is a growing need and a central need for your businesses." "This is something Israel is developing by leaps and bounds on a global scale and we are open to participation not only with governments, but also with companies," he continued. "And indeed the biggest companies in the world in this field and related fields are now coming to Israel to invest in cyber security and we invite you to do the same."